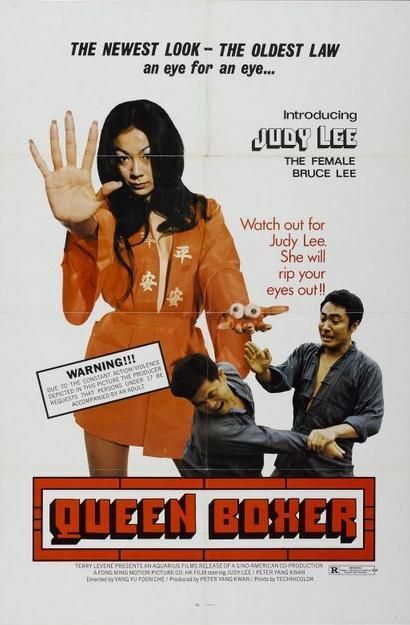 QUEEN BOXER (1972, aka THE AVENGER) is the film that introduced fighting femme Judy Lee (aka Chia Ling) to a worldwide audience. It’s a simple low-budget tale that’s as much crime drama as kung fu movie as it chronicles the clash of two lone kung fu fighters against a powerful crime boss in early 20th century Shanghai. One of the two is Fan Kao To (Yeung Kwan), an unemployed laborer who seeks to rally the working people of Shanghai, in a rare display of kung fu social consciousness, to gain control over their conditions. The other fighter is a mysterious woman who shows up in Shanghai looking for crime boss Pai Lai Lee. Her mission has some connection, eventually revealed, to the recently deceased gangster Ma Yung Chen whose story, incidentally, was told earlier the same year in the Shaw Bros. rise-and-fall gangster kung fu classic, BOXER FROM SHANTUNG (1972), which starred Chen Kuan Tai. Ma’s demise (which took nearly 20 minutes in SHANTUNG) is recreated–in condensed form–in a pre-credits sequence in QUEEN BOXER.